Virtually all of the good quality products are built in factories around the world. Cars, planes, ships, computers, printers, cell phones, even the pen you write with are built in factories. In addition, even site built homes use many components that were produced in factories. This includes floor joist, roof rafters, roof trusses, doors, cabinets etc. Modular homes take a shorter time for construction compared with site-built homes. This is due to the fact that while the modular is being built in the factory, another crew is building the foundation at the same time. While it takes a year or more, to build a site-built home, it takes from three to eight months to build a modular home. This depends on the complexity of the modular home. Here is how the neighbor of one modular home put it: I watched a friend’s house being set. The modular, or the boxes, one by one, were lifted with a crane and placed on a foundation that has been poured several weeks earlier. I returned on the second day and the house was almost completely done. It was ready much sooner than any other house I had ever seen. For neighbors who have been away for a few days, they are shocked to see a home where none was standing just a few days earlier. People are often “wowed” by the sudden existence of new modular homes. 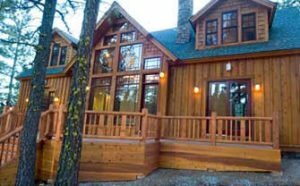 Modular home construction is not delayed by rain, snow or extreme cold or hot weather. Also, modular homes are excellent choices for areas of short construction seasons such as Truckee, California, Lake of the Woods, Oregon, etc. Modular homes are excellent for urban construction, as there is no need for a big storage area. Once the foundation is complete, the house can be lifted right from the truck and assembled in a day or two. Modulars worked great for projects near downtown Los Angeles, CA. If you built a house before, you know how many times your contractor came and asked you to pay additional costs for some issue he/she faced during construction. The contractor, or a member or your family may suggest an upgrade or a change during construction which requires more funding as well. The good news is this is not the case for modular homes. Once you have agreed with the modular home manufacturer on your choices for your home, your cost are set. No changes, no bad surprises, no stress, no headaches. Modular design and construction is a key factor for the economy, and efficiency in modern home construction. All materials, from framing, roofing, and plumbing, electrical, and interior finishes are equal or better to that used in site built construction, yet cheaper due to the big purchase power of the manufacturer. Generally, the cost of modular homes per square foot is less expensive than on-site construction by 10% to 20% on average. To avoid all unnecessary waste in the production process, this yields to a large savings for the client. Customization, efficiency, sustainability and economy are the basics for today’s modular homes. Every modular home is different. There are many options available for the clients to choose from. Different plan dimensions, layout, room number and sizes, hip, gable or vaulted ceilings are all available, with infinite finishes, high ceiling, two story modulars, that open to the living room below, fire places, large balconies, porches of all sizes, etc, are all available with today’s custom designed modular homes. Not only are modular homes used for new home construction, but also, to replace or add to many aging homes in the matter of few months. How about second story? A modular could be used to add a second story to your home in a very short amount of time. The warranty offered on a modular home is another incentive. Most site-built homes have a one year warranty, while modular companies generally offer a ten-year warranty on their homes. Building a home can bring a lot of stress to most families. I have had several divorces happen in the middle of designing or the construction of a new home. In one case, I had to threaten one couple to whom I was designing a site-built home for, that if they did not bring their argument and stress levels down, I would drop off a couple of shipping containers on there lot, and that would be their new home. But we do not have to go that far; modular homes deliver the solutions to the high stress that most families go through for their new homes. Since modular home take a much shorter amount of time for construction, and is done in the factory, the stress period of choosing and changing anyone’s mind is significantly shortened. In addition, the modular home is done in a factory, which is less accessible to the couple during fabrication. The modular home choice brings a significant reduction to the stress. In matter of couple of weeks, the modular design is finalized, and everyone knows that is it. The home is then under construction in the factory, at which point changes cannot be made, which alleviates the stress. Modular homes are free of mold. In contrast for site-built homes, it is hard to avoid moisture when you build on the open on-site. One-third to one-half of all structures have damp conditions that may encourage development of mold. Source: U.S. EPA. 59% – A lot. It is making business difficult. 29% -The media is overplaying the thing. 12% -Very little. It is not a serious issue. Watch BluWood make a sensational international debut on the Oct. 1 episode of ABC’s Extreme Makeover: Home Edition as it frames a new home for Maryann Gilliam in Michigan. Maryann’s husband tragically passed away last year leaving her to raise six children alone. Her family’s doctor theorizes mold and toxins found in the home may have been responsible for his death. The solution is to solve the mold problem before it starts, homes built in controlled environments such as modular home facilities are an excellent start to solve mold problems. Modular homes are built from the best quality lumber, and are protected in the factory controlled environment. In contrast, on-site houses are typically built from average quality lumber and are open to rain and/or snow during construction. This can cause wood to warp or swell, leading to a lifetime of structural and mold problems. Modular manufacturers offer skilled craftsmen steady employment and benefits, resulting in a consistent skilled labor force. You will have no worries about delays relating to inexperienced or tardy labors as your home is nestled within the factory confines. With additional insulation and precision craftsmanship, modular homes are significantly more energy efficient. Your utility bills will be far cheaper than your neighbors and save you more money throughout the life of your modular home. Faster use. You can choose a brand new inventory modular homes that is already built and move it on to your land in a matter of weeks. You can enjoy your home next year instead of waiting for it. Less costly design and engineering needed for modular homes. Guaranteed price for modular homes. It is easier to manage modular homes construction with less trade involved. Fewer mistakes, less costly corrections with modular homes. Less weather damage as most of the construction is already completed by the modular manufacturer. Less pilferage and vandalism with modular homes. Less danger of construction fires with modular construction as since the most of the sheetrock is already installed. Less costly job-site payrolls as the majority of it is already paid by the modular manufacturer who pays a lower rate than a site-built manufacturer. Less costly worker’s compensation insurance. Less costly job site inspection as most of it is already done in the modular manufacturer facilities. Faster use, faster income for modular homes. Fewer mistakes, less costly corrections. Less danger of construction fire. Smaller, less costly job-site payrolls. Less costly job-site inspection, fewer red tag violations. Less costly design and engineering. Less costly job-site liability insurance. Less costly accounting and bookkeeping. A much better return on investment.